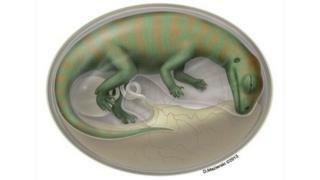 Scientists have gained a remarkable insight into some of the oldest dinosaur embryos ever found. The remains of the creatures were unearthed in south west China and are about 190 million years old. They belong to a group of dinosaurs called Lufengosaurus, long-necked beasts that fully grown would have stood about 9m (30ft) in height. The creatures were preserved at different stages of their development, shedding light on life inside the egg. Lead researcher Robert Reisz, a palaeontologist from the University of Toronto Mississauga, in Canada, said: "We are looking at various stages in the embryonic life of this animal, and we can put this together to get a growth trajectory of the embryo itself - something that has never been done before." Reporting the findings in the journal Nature, the international team concluded that the animals would have grown extremely quickly during their incubation period. Fossil finds have revealed a wealth of information about the dinosaurs that once roamed the Earth, but little has been known about the very earliest stages of their lives. Three years ago, palaeontologists discovered fragments of fossilised bones in China's Yunnan Province. An analysis revealed that these were the remains of about 20 Lufengosaurus embryos, whose lives were cut short by a flood. Prof Reisz said: "The nests were inundated by water and basically smothered, and the embryos inside the eggs died and then decayed. "And then more water activity moved the bones and concentrated them into a very small area. We only excavated 1sq m of the 'bone bed' and we got more than 200 bones." The researchers studied the fossils using a variety of techniques, including histology and infrared spectroscopy with a synchrotron in Taiwan. "The neat thing is that we can get these materials in our hands, we can handle them, cut them, we can look inside the bones - and what we found out is they are growing quite fast, faster than other dinosaurs and faster than a lot of living animals whose embryology we know very well." While the researchers cannot establish how long the incubation period was, this finding does suggest that it was short. The team believes the animals emerged well developed and might have continued to develop quickly. Professor Reisz said: "We are hypothesising if this very fast growth rate we see in the embryos was maintained in the hatchlings and the juveniles, then we have a very fast growth rate in the initial stages of the life of this animal." The Lufengosaurus belongs to a group of dinosaurs called the sauropodomorphs, and is a predecessor of the sauropod, a true giant of the dinosaur world that could grow up to 60m (200ft) in length. You can hear more about this research on the BBC World Service programme Science in Action; a schedule of broadcasts can be found here. Or you can listen anytime here or download the podcast here.